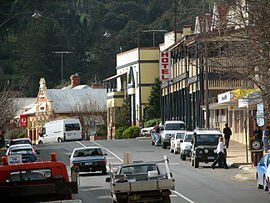 Bridgetown is a town in the South West region of Western Australia, approximately 270 kilometres (168 mi) south of Perth on the Blackwood River at the intersection of South Western Highway with Brockman Highway to Nannup and Augusta. The area was previously known as Geegelup, which was believed to mean "place of gilgies" in the Noongar Aboriginal language, referring to the fresh water crustaceans that inhabit the area. However, recently discovered research made available through the Bridgetown Tourist Centre suggests the actual meaning of Geegelup may be "place of spears". In 1857, Edward Godfrey Hester (now honoured in nearby Hester) and John Blechynden settled in the area. In 1861, convicts built the road from Donnybrook into the area. Bridgetown's name was first proposed by surveyor Thomas Carey in 1868, for two reasons - "as it is at a bridge and the Bridgetown was the first ship to put in at Bunbury for the wool from these districts", and was approved and gazetted on 9 June 1868. From then until about 1885, many buildings including the primary school (1870), post office and two hotels were constructed, many of which are still standing today. In 1885, the Bridgetown Agricultural Society was formed and local farmers produced sheep, cattle, dairy products, timber, fruit and nuts. The gold rush from 1892 onwards brought prosperity to the town and saw a considerable increase in settlement. In 1907, a number of significant buildings including the police station were erected. Until the 1980s, the land surrounding Bridgetown was almost exclusively used for and . From the late 1970s, the area became increasingly attractive to tourists as a tranquil and picturesque country town an accessible distance from Perth. Some people, attracted by the aesthetic qualities and rural lifestyle on offer, sought to move to the town permanently, and this resulted in a strong demand for residential and hobby farm allotments, at a time when there was, coincidentally, a global downturn in agricultural markets. Many farmers sold up, and much of the most aesthetically pleasing land was subdivided and sold to urban refugees. The demographic change had a profound impact on the town's industry, replacing demand for farm services with demand for services in the tourism and recreation sectors. However the dramatic increase in infrastructure such as housing, roads and power lines, has detracted from the rural aesthetic that attracted the urban refugees in the first place, and therefore has the potential to lead to the rejection of the locality by the next wave of urban refugees. In 2009 a bushfire broke out near the town and destroyed at least three properties in the area. June to August: Bridgetown in the winter festival. Shops are adorned with blue lights, many events and workshops. ^ Australian Bureau of Statistics (25 October 2007). "Bridgetown (Urban Centre/Locality)". 2006 Census QuickStats. Retrieved 2 October 2008. ^ Shire of Bridgetown-Greenbushes. "Tourism - Heritage". Archived from the original on 5 October 2006. Retrieved 3 November 2006. ^ Western Australian Land Information Authority. "History of country town names – B". Retrieved 17 January 2007. ^ Tonts, Matthew; Greive, Shane (2002). "Commodification and creative destruction in the Australian rural landscape: the case of Bridgetown, Western Australia". Australian Geographical Studies. 40 (1): 58–70. doi:10.1111/1467-8470.00161. ^ "Homes destroyed in Bridgetown fire". ABC Local. Australian Broadcasting Corporation. 17 January 2009. Retrieved 31 December 2010. ^ "Climate statistics for Bridgtown". Bureau of Meteorology. Retrieved 5 December 2018. ^ "Climate statistics for Bridgtown Comparison". Bureau of Meteorology. Retrieved 5 December 2018.